I arrived in Saigon last night (or Ho Chi Minh City as it is also known). My plane from NYC to Hong Kong was delayed several times, making my connection tighter and tighter (about 15-20 minutes by the time we landed in Hong Kong). But there were enough people on our Cathay Pacific flight out of JFK who were connecting to the same flight, so they held the plane for us. I can’t remember the last time that’s been done on any of my flights. But we all really appreciated it. I have a friend, Sue, who lives here in Saigon whom I will be visiting. 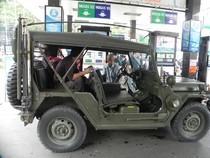 She had Mr. Dinh pick me up at the airport in the same ‘one of a kind’ jeep as last year. She arrived home later than me last night from a business trip, so we haven’t hooked up yet. I look forward to hanging out with her for a couple of days before heading to Myanmar. Meanwhile, this morning I was starving, since my exhaustion won out to my hunger last night, and I crashed without going to dinner. So this morning I took a walk to get, #1, coffee!! And then had to have a typical Vietnamese breakfast of Pho (noodle soup). Yum. When I asked for my second cup of coffee, the waiter informed me that refills were not included. I smiled and assured him that I would pay for a second cup. When he brought it out, he indicated that he would not charge me! See, smiling really works. As I walked around the familiar streets, I recalled fond memories of my prior visits, the first of which was in 1997, which was when I first met Sue. (We have a mutual friend in San Francisco…has anyone ever said “it’s a small world.”) One of my first memories of this city were the hundreds and hundreds of bicycles everywhere you looked. 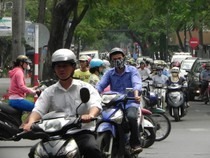 And we had to learn the proper way to cross the street, which was to wait until there were no trucks or cars in the mix, and then just step off the curb and start walking….don’t stop, don’t slow down, and the bikes just maneuvered around you. Now, instead of bicycles, it’s hundreds and hundreds of motorcycles…but the trick to crossing is still the same! On that first visit, in addition to Saigon, we visited Dalat (we weren’t that crazy about it there, so didn’t stay too long). We hired a driver and headed to Nha Trang (beautiful beach), then kept on going up the coast to HoiAn, Hue and Hanoi. It was a phenomenal trip. It was before I had a digital camera, so I will have to get out my 35mm photos and see if I can digitize them. My second trip to Vietnam was last year, when I stopped off in Saigon again, and then went up to SaPa. You can read a little more about the 1997 visit, as well as details about my second visit on my blog about last year’s RTW trip. I love being able to share my adventures with you, as I continue to explore the globe.